Max is a teenage girl who recently moved to Lebanon, Kansas, with her mother, Caitlin. She joined with a small group of friends, Eliot, Bea, Nathan, and Stacy, whom she would form a crush on that would be reciprocated. Max is sitting outside the Lebanon Vista movie theater with her friends as Eliot begins talking about strange stories about the Winchesters. Stacy tells Max she will see her later at "the thing." Before leaving, Stacy remarks that whoever the Winchesters are, they have an awesome car, which gives Max the idea to steal it in an attempt to impress her. 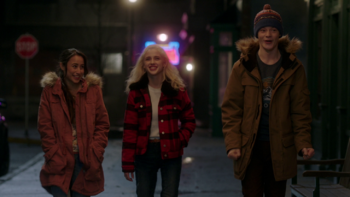 Eliot, Max, and Stacy walking together after finding out the truth about the supernatural. She takes the car to the old house on Route 36 for the Skip Day party, where she shows Stacy all the boxes of things she found in the backseat. Eliot soon shows up to the party to warn Max about Sam and Dean, who are looking for her, but he is blown off until Sam and Dean arrive as FBI agents and order everyone out of the house. When Eliot runs back into the house, Max and Stacy follow him and witness John Wayne Gacy's ghost burn away. Sam and Dean sit the three teens down and tell them the truth about the supernatural, which Max, along with Eliot and Stacy, agrees to keep a secret. In the altered timeline, when Sam attempts to say hi to Max, he is greeted with a disgusted "weirdo" from her. Sitting with her friends at the restaurant where her mom works, they are interrupted by the arrival of Zachariah and Castiel, who demand to know who had been messing with time, threatening to have Castiel kill everyone if they don't answer him. Sam and Dean notice the light coming from the restaurant, and are able to kill Zachariah and banish Castiel. When the timeline is restored, Max and Stacy walk down the street alongside Eliot, holding hands and smiling together while Eliot discusses the Winchesters. Stacy, Max, and Eliot meet Jack when he goes shopping at the mini-mart where Stacy works. Stacy and Max invite Jack to hang out with them later at an old farmhouse. At the farmhouse, Stacy and Max are studying for the SATs, and Eliot is reading a book on monsters, when Jack arrives carrying a load of lore books from the Bunker. As Jack questions the girls about the music they are listening to, Elliot questions Jack about how demons look. Jack reveals they don't have horns and look like smoke, and can possess anyone, and tells them he has killed a demon. Outside Jack shows the others his angel blade. He tries to show them how to throw it into a tree, but misses despite a very large number of repeated attempts. Finally, Jack uses his powers to show off, sending the blade first into the tree and then, after retrieving it, causing it to fly around in the air. As the weapon zips around them, the kids get frightened, but despite repeated pleas, Jack refuses to stop. Stacy panics and steps into the path of the blade and gets stabbed deeply in her abdomen. Max tries to comfort her while Eliot calls 911. Jack intervenes and uses his power to heal Stacy. However, the damage is done -- Max, Stacy, and Eliot tell a confused Jack to leave and stay away. On Twitter, actor Zenia Marshall who played Stacy dubbed the ship of Max and Stacy "Stax." This page was last edited on 27 March 2019, at 05:17.